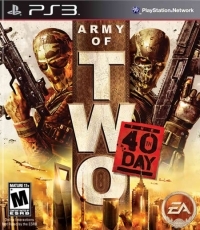 Description: Army of Two: The 40th Day is a third-person shooter based in groundbreaking cooperative gameplay functionality. Sequel to the 2008 game of the same name, and featuring series heroes, Rios and Salem, in this new iteration players have a bigger playbook of features and a new arsenal of co-op moves that either player can perform at any time, opening up fresh strategies in the face of overwhelming odds. In addition, the game features advanced weapon customization and upgrade systems, as well as four explosive online multiplayer modes, each focused on unique cooperative play. This is a list of VGCollect users who have Army of Two: The 40th Day in their Collection. This is a list of VGCollect users who have Army of Two: The 40th Day in their Sell List. This is a list of VGCollect users who have Army of Two: The 40th Day in their Wish List.